Sarah Palin Glasses Trend Again? Will Sarah Palin Glasses Trend Again in the 2016 Election? Our glasses fashion blog reviews Sarah Palin sporting a fashionable studded belt, American flag bracelet, and her signature Sarah Palin glasses: The Kawasaki 704, she addressed rumors about her bid for presidency in an interview she gave in Las Vegas. Indeed, former Alaskan governor Sarah Palin told the Press that she’s “seriously interested” in running for President of the White House in 2016. The GOP’s 2008 vice-presidential nominee is thrilled about the possibility of running for President. It looks like she gave in to another style of new glasses styles and is rocking those as well. Will her frames steal the show once again? Only time will tell. 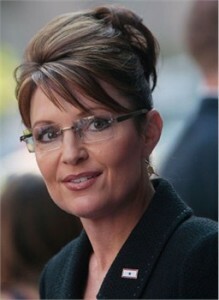 If Sarah Palin runs for President, the public is going to see a lot of her and her cool glasses. Will it encourage new generations of political hopefuls to take out their colored contacts and replace them with trendy glasses? Who honestly knows? In all likelihood, seeing her face on TV as well as ad campaigns and magazines once again will spark interest in the frames she’s wearing. People like to know more about the things they admire. Glasses are in and Sarah Palin proves that. Google “Sarah Palin glasses” and see what comes up. The Huffington Post dedicated an entire page of its website to the topic. People love her frames and can’t wait to get their hands on a pair of their own cute glasses. That’s why many take to the web in search for the craziest, brightest colored, and fun glasses available. Trendsetting hopefuls scour the internet looking for the coolest glasses they can find to wear. What they discover is astounding. Entire websites celebrating funky frames exist for them to look at. Glasses made from wood and acetate catch people’s eye and get them interested in the different materials being used to create frames. Bold colors and patterns make even young eyeglass wearers proud of their spectacles. Cool glasses are so popular that online retailers rush to restock their most sought-after frames. They work hard to offer the best selection so ordering prescription glasses online is easy. Discount frames make it so customers purchase more than one pair of eyeglasses at a time. Will your next pair define who you are as a person?Are you looking for your own Sarah Palin glasses? Do you want to be known for your good taste and impeccable sense of style? If you do, you’ll find a wide variety of designers and shapes to choose from. You don’t even need to leave the house to shop for eyeglasses. All it takes is your prescription and an accepted method of payment in the form of debit or credit card. Some websites even accept PayPal.Shopping for eyeglasses online is quick and easy. After looking through the inventory on a retailer’s site, you’ll have a few frames in mind to purchase. Select the eyeglasses that best represent you as a person. Sarah Palin found frames that suit her face. Share with us and our thousands of readers in the COMMENTS SECTION BELOW your favorite Sarah Palin glasses story and what inspired you! This entry was posted in Sarah Palin glasses and tagged cool glasses, cute glasse, fashion blog, Glasses, glasses styles, new glasses, rimless frames, Sarah Palin glasses, Trendy Glasses. Bookmark the permalink.